Disney - Pixar Filmed and Interviewed at The Old Riverton Store for the animated feature - "Cars" - Scott Nelson and the Store are listed in the movie credits and featured in the Bonus section of the DVD - Visit our Gift Shop where the - "Cars" Movie Plays Continuously! Route 66 Association of Kansas ROUTE 66 HALF MARATHON November 24th, 2012 Race from Kansas State Line to Oklahoma State Line "On Kansas Historic Route 66"
Route 66 Historic Site NATIONAL REGISTER OF HISTORIC PLACES "A Rare Form of 1920's Architecture" "The interior of the store has changed little since 1925" "A must see stop for Route 66 travelers"
In continuous operation since before U.S. 66 became the official cross-country highway from Chicago to Los Angeles. Still operating as it did back then, it serves as a stopping, shopping place for the small community of Riverton, as well as for travelers on Route 66. It was nationally familiar in its early days, because this Southeast corner of Kansas literally tied 66 together, and today it is internationally known as one of the most authentic, still working 75-year-old stores of its kind on all of Route 66. It has groceries, produce, flowers, an old time Deli serving excellent sandwiches; gifts (including area handcrafts), lots of Route 66 memorabilia and the friendliness of Yesterday. It's a gathering, meeting place for those who have grown up on or near Route 66 and travelers from everywhere New York, Utah, Canada, Germany, Japan, France it's a fun place where you can relax with coffee at a table on the Produce Porch, where you can make new friends while you experience and enjoy a glimpse into the past. Old Riverton Store on National Register of Historic Places. Once known as the Williams Store, Eisler Brothers Old Riverton Store, located on HWY 66 in Riverton, Kansas, received the honor of placement on the National Register of Historic Places. The store at Riverton was also call the Lora Williams AG Food Market for some years. It was built by Leo Williams, owner, in 1925 and has retained a very high degree of integrity according to the write-up that came with the information and pictures. The existing building originally had an open front porch, but the present closed in proch replaced that in 1933. It is one story, built of hollow, dark red bricks on a concrete slab foundation. 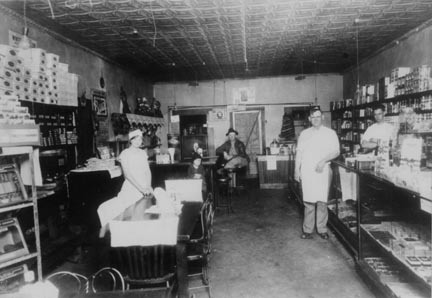 The interior of the Williams' Store in the 1930's. The tables and chairs at the front show where customers enjoyed their barbecue sandwiches and home made chili. The interior has changed little since 1925. It is divided into two primary spaces, the east section which was, and is, used as the commercial area and the west section consisting of three rooms in a linear arrangement with a small bath, (added later) which was the residence of Leo and Lora Williams and their daughter, Jane Marie. The kitchen was in the commercial part just west of the meat lockers. A pressed metal ceiling is used throughout the building. In the 1940's the Williams family moved their residence to the house next door to the store. Today the front part which was originally the living room, houses Route 66 merchandise and souvenirs. There were gasoline pumps in front of the store for many years, leased first to Texaco and later to Standard Oil. The store itself carried everything from groceries to general merchandise-shoes, clothes, milk, fresh meat, a wide variety of goods. Leo also barbecued beef and venison in a pit behind the store and served sandwiches to customers. Lora served her speical recipe of chili. Customers were mostly local people, but the store also played an important role on Route 66 as the traffic increased through the late 20's, 30's, 40's and 50's. 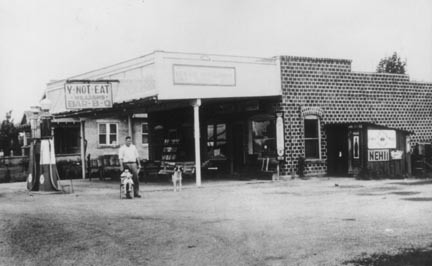 Leo and Lora Williams ran the store until 1945 when they leased the grocery to Lloyd Paxson. Leo died in 1948, so when the Paxson lease expired, Lora returned to the store and operated it until about 1970. Joe and Isabell Eisler of Allen, Texas, purchased the business in 1973. It has continued to operate as a grocery and deli, just as it had, with very little changes in it's decor. 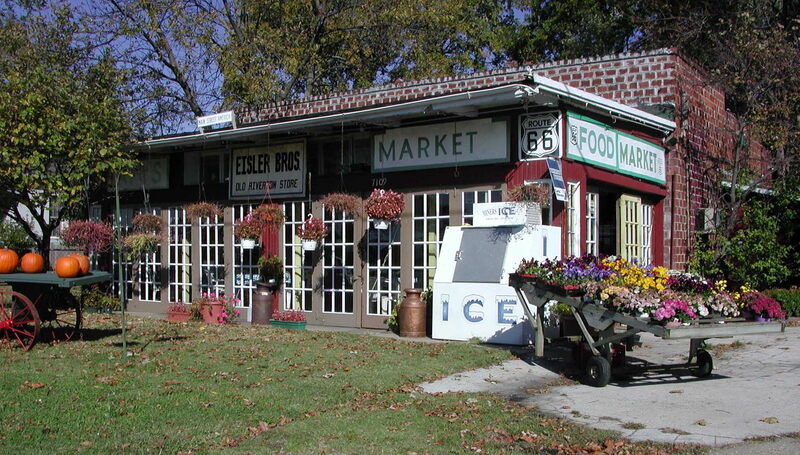 The store was managed for the Eisler's by their nephew, Scott Nelson. Scott purchased the store March 31, 2011 from the estate of the Eisler's. Scott is the President of the Route 66 Association of Kansas. Try 'em - You'l Like 'em! Nothing like a Sandwich for a speedy Treat! Come in and ask for our Daily Deli Sandwich & Fountain Special. Try our sandwiches and you will come back for more. The folks at our Deli aim to please. Meats: Bologna, Chopped Ham, Liver Chese Ham & Cheese Loaf, Baked Ham, Cooked Salami, Pickle Loaf, Old Fashioned Loaf, Pepper Loaf, Roast Beef, Turkey, Genoa Salami, Smoked Salami,Smoked Turkey. Hanging Baskets -Pansies - Petunias - Geraniums -Tomato plants - Cabbage - Boccoli - Bluk Seed - Pkg. Seeds - Pots Potting Soil & Plant Food. At Eisler Bros. we care....and plants that are cared for show it! Always perfect for the special gift. Here at Eisler Bros. there is a treasure trove of unique Gifts, Imports, Crafts, Kansas Handicrafts and souviners as well as Historic Route 66 Memorabilia. Did you know we also have Copy & Fax service? Kansas Vision Cards are always Welcome! ©Copyright 1996 Transa, Fairview, Tx.